Today we visited the gorgeous home of James and Dolley Madison, Montpelier. It differed greatly from Monticello, in grounds as well as architecture, though Jefferson had a hand in the final Madison era renovation of the home. 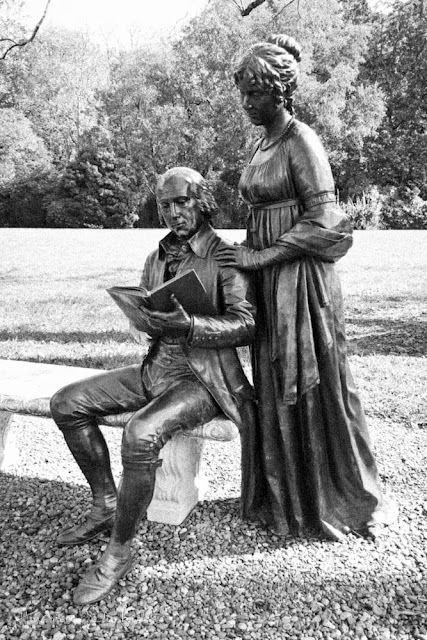 A beautiful bronze of James and Dolley Madison. The sculptor made these true-to-life using original clothing owned by the Madisons (how cool is that!?) 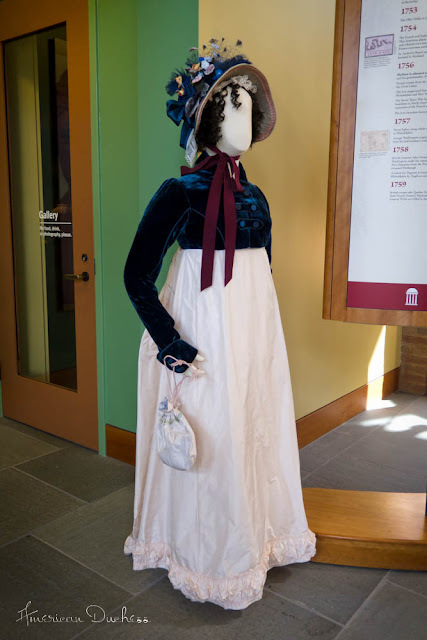 Dolley is about 5'4"
In the Montpelier Visitor's Center there are several mannequins displaying costumes from the "American Experience" Dolley Madison documentary, a wonderful series with fantastic costumes. The "lawn ornament" just off to the right of the main house. 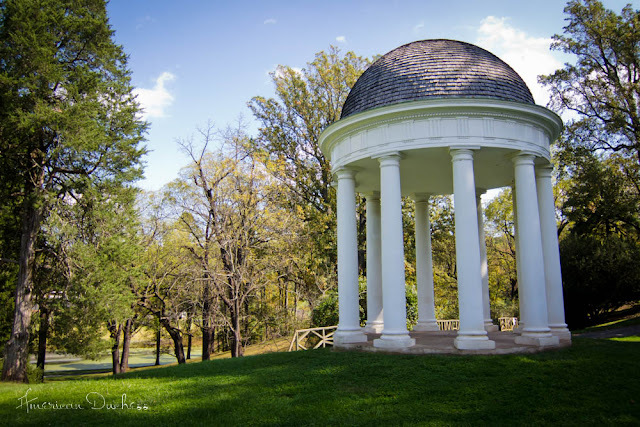 This was apparently intended to be an outdoor study for President Madison, and was built atop the icehouse. He never used it as such. 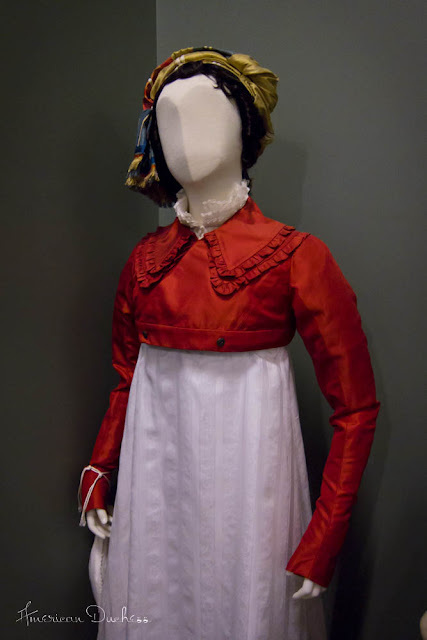 Another splendid costume from the Dolley Madison documentary. Dolley was known for her turbans. This one, from the documentary, was of beautiful, colorful fabric. Again we could not take photos inside the house - such a pity! - but I made a little sketch of the outside, before we left on our travels northward to Manassas. The next best thing to being there! Your sketches are wonderful. Thanks for the pictures! I'd love to visit here someday. And your sketch is lovely! I've never been a big fan of bonnets, but I think I just fell in love. 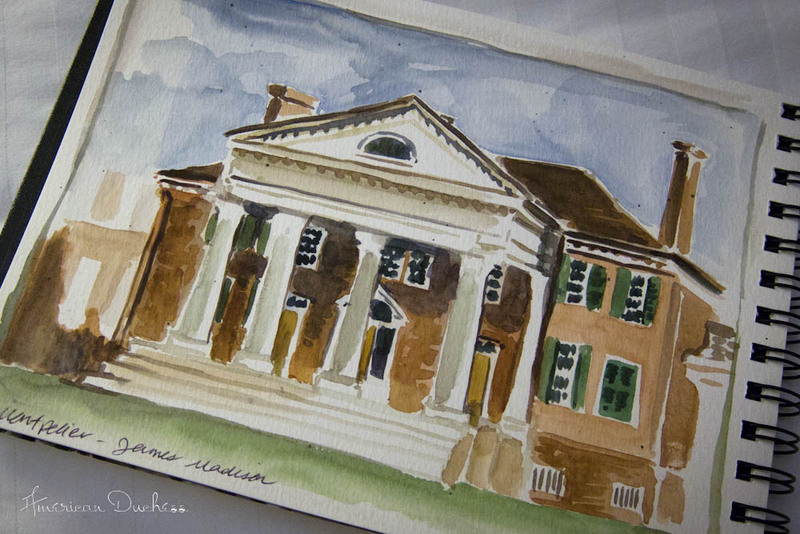 How long have you been doing watercolors? That's such a good practice to get into. so nice pics . so beautiful blog . Monroe's Ashlawn is another lovely presidential home that's gotten renovations in recent years. If you ever get a chance to come back to Virginia it's worth a visit! 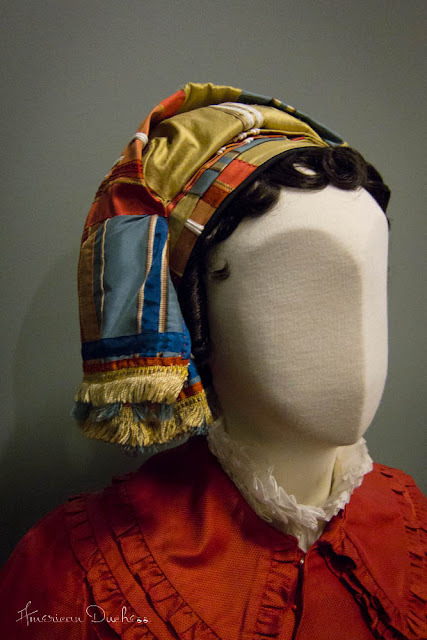 Dolley Madison was one stylish lady, wasn't she? Even in her portraits and photos as an old woman, you can tell she took great interest in how she dressed. Incidentally, I'm pretty sure that the fabric for that turban for the documentary is from Delectable Mountain Cloth in Brattleboro, Vermont. While I was living in Massachusetts, some friends and I took a spring break road trip (of sorts) to go buy historical fabric in Vermont and to visit a friend in New Hampshire (states in New England are so SMALL - we did this all in a day! ), and the very sweet proprietor of the fabric shop showed me a binder of pictures of all the lovely movie costumes her fabrics have gone into creating - which included a bunch of things from the "American Experience" documentary, including some turbans. Who knows - if you've taken a fancy to that fabric, she might still have some tucked away somewhere! By the by - when I told her I was a historical costumer making a reproduction gown, she gave me a marvelous discount, told me about how she had previously refused to sell this fabric (at twice the price) to a man who wanted to make curtains with it, and asked me to tell my friends about the place, because historical costumers are her favorite thing. They do some online selling at http://www.delectablemountain.com/ and they'll send along sets of swatches if you're looking for anything specific. 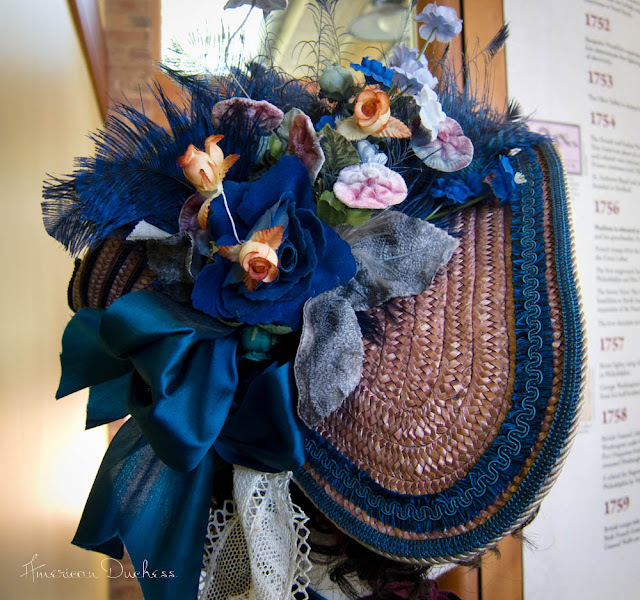 It was pretty much a historical costumer's dream come true, being in that store, and so much fun to see the fabrics alongside the movie costumes they'd been made into. I just watched the "Dolly Madison" series, and it is a great story. The costumes are simply amazing and inspirational! Love your post!